We believe that holy Catholic families can transform the world. But this won't happen unless parents first embrace their God-given mission to make the Faith come alive for their kids. We're here to provide you with Catholic family faith support so you can take up this critical mission, beginning today. Learn about this critical mission that cannot happen without engaged parents taking up the mantle as primary Faith educators in the family. Our events ministry creates God-centered experiences for the whole family. At Catholic Familyland, faith, family, and fun come together for unforgettable experiences and spiritual breakthroughs. Our life-changing events draw each family member to an encounter with God at the same time, in the same place. Get special access to a wealth of videos, downloadable e-books, and other resources that will help you and your family learn and grow in Faith together. The portal also gives you complete access to the interactive Family Catechism, which includes videos of Cardinal Francis Arinze for every question. Sign up for your free account today! Is God calling you to serve families as an AFC missionary, or to embrace a vocation as a married or celibate AFC Member? We invite you to learn and pray about becoming more closely united to this ministry of Catholic family faith support. There are so many ways you can transform your world as God works in your life and the lives of those around you. Find spiritual reading, statues and pictures for your home, audio and video programs from Church leaders and teachers, and so much more. We love hearing from you! Head over to Facebook, Instagram, or YouTube and drop us a comment to let us know how we can support you. We are families, single celibates, and young people united in prayer and mission. This mission is here to support your family. ...so that, with the help of the Holy Family, each person can fully live their baptismal consecration and achieve the holiness God desires. 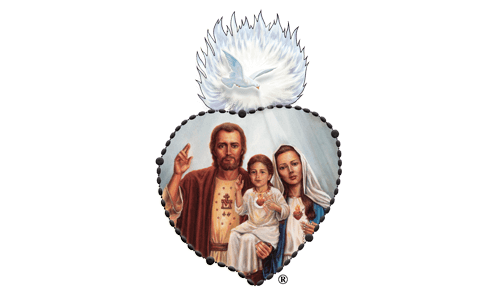 All for the Sacred and Eucharistic Heart of Jesus, all through the sorrowful and Immaculate Heart of Mary, all in union with St. Joseph. Encounter Our Lord. Be immersed in prayer. Be renewed in life. It's a chance to deepen your faith and reconnect with God! Already know which event you’d like to attend? Head on over to online registration. Encounter God as a family, at the same time, in the same place. Creating God-centered family time is the best way to fulfill your mission of passing on the Catholic Faith to your children. With our new web app, creating those experiences can be easy and fun for the whole family. It’s an engaging, flexible, and growing collection of interactive family activities, videos, books, and more that can help you bring the Faith to life and lead your family closer to God. Unlock the door to enjoyable, interactive, and prayerful family time. With the Bring Holiness Home Portal, creating God-centered experiences can be easy and fun for the whole family. You can be the one to lead your family closer to God. The Bring Holiness Home Portal can help. Use this question and answer catechism to learn the truths of the Catholic Faith. The online Family Catechism includes video commentary from Francis Cardinal Arinze for every question. After several years offline, the Family Catechism is back with a clean, modern feel and easy-to-use layout. Find spiritual reading, statues and pictures for your home, audio and video programs from Church leaders and teachers, and so much more at the AFC online store. There’s something to help everyone in your family learn and grow in the Faith. A vocation within a vocation. These men and women commit to living the AFC's charism and spirituality in the midst of their married or single life. Explore this structured path to holiness. A life given totally to God for families. These men and women consecrate themselves to God through private vows of chastity, poverty, and obedience, and work with the AFC in Catholic family faith support. Are you called to this joyful way of life? These young adults (ages 18-24) dedicate a summer—or an entire year—to prayer, community, and this mission of supporting families in the Faith. Will you be one of them? Join the mission and help us lead families to an encounter with Jesus Christ. Through this summer missionary program, teens (ages 16-17) are encouraged to grow in their relationship with God as they share His love with families. Have an amazing summer growing in faith and serving families. We are a non-profit, supporting families all year long! Your generous giving is what makes the success of this essential Catholic family faith support mission possible. There are so many ways you can get involved in this exciting mission for families. Find a way that works for you! You can be a part of this movement of families, for families. Support us financially with a tax-deductible monthly or one-time gift. Together, we can help families become what they were meant to be—holy families. Unite yourself to the spiritual battle for holy families by providing for the maintenance and expansion of this holy place. Through your gift, unite yourself to this mission for souls.